India have had their fair share of problems in their ODI setup. The biggest issue has been their shaky middle order. And it is this middle order that threatens to ruin their party in the World Cup in England next year. 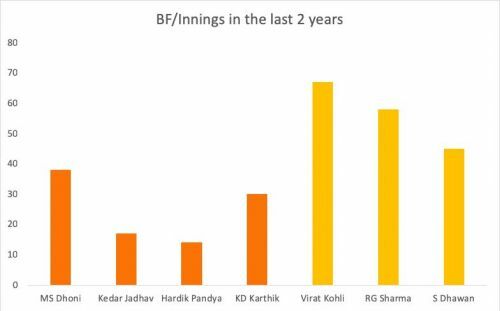 Part of the reason for the middle order's underexposure is the formidable top order comprising Shikhar Dhawan, Rohit Sharma and Virat Kohli. There's almost a sense of inevitability that one can feel as Kohli strides out of bat in a 50-over contest. A few nervy balls; an edge, a hesitant fifth stump waft. But as soon as he crosses double digits, half the job is done. By the time he's reached the 30s, a half-century feels unstoppable. And once he gets to the half-century mark, a hundred is almost guaranteed. Such has been Kohli’s phenomenal run that if one of Sharma or Dhawan stick around, India's rusty middle order is hardly exposed. With the ominous form of their top three and only a handful of ODIs left before the biggest tournament, the middle order comprising the sluggish MS Dhoni is hardly ever going to be needed. In such circumstances, a top-order collapse such as the third ODI against the Windies or the Champions Trophy final could mean that the middle order will be simply incapable and inexperienced to save the sinking ship. Let us take a look at statistics that give an insight into this disparity. Here are the balls faced by batsman per innings in the last two years. The numbers very clearly illustrate the fact that the top order (indicated in yellow) are facing a large number of balls in comparison to the middle-order (indicated in orange). 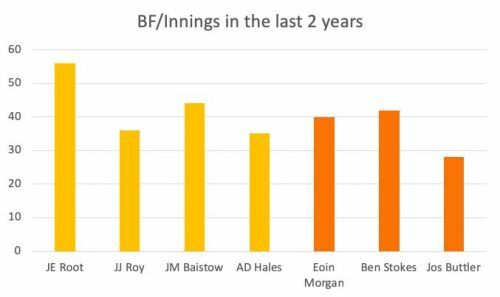 While it is easy to put aside these statistics stating that the top order will naturally face more balls than the middle order, similar numbers for England reveal a completely different story. The top-order and middle-order are capable of contributing consistently. Owing to Joe Root's poor conversion rate, the middle-order get lots of opportunities to bat. This would mean that they are ready to face pressure situations during big World cup games in case a top-order collapse occurs unexpectedly. In contrast, India's top order do not vacate their presence enough to allow the untested middle-order receive ample opportunities to bat. Unsurprisingly, Kohli has faced the most number of balls (2616) among all international batsman in the last two years. How can you give the middle order match-practice when one man is in such unstoppable form? Perhaps, one of the top-order batsmen can demote himself to number four to give the middle order game time. Another flaw in India's top-order is that they bat a touch too slowly before blossoming consistently as the innings progresses. While the job of stabilising the innings during the middle overs is done commendably, they are often conservative in their approach at the start. Such an approach can cost the team 30 or 40 runs on flat pitches. Such is the nature of one-day pitches these days that 300 is sometimes simply under par and can make for an easy run-chase on a flat track. With one of the top order batsman at the crease, it's as if the team is always aiming to secure 300 than gamble on 350. Questioning the prowess of the best top-three in the world is certainly not the intention. However, their strength could very well become their own weakness during India's World Cup campaign in 2019. In contrast, England's batting lineup appear better placed. 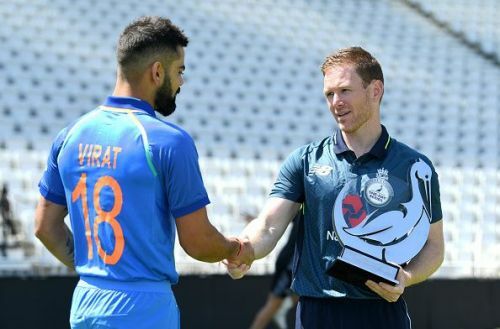 India or England - who will lift the cup of glory?